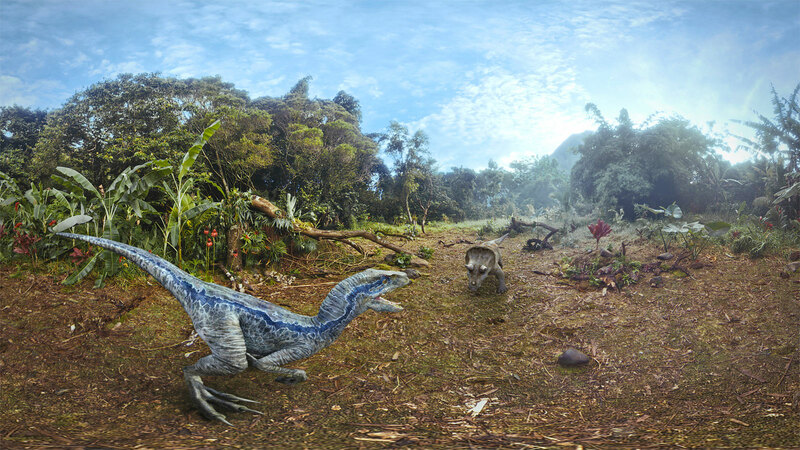 Follow a velociraptor in 360-degree video. Now that Oculus Go is here, you can expect a deluge of experiences built to take advantage of affordable VR -- and one of the first will be enticing if you're a Jurassic Park fan. Felix and Paul Studios (the team behind Jurassic World: Apatosaurus) has returned with Jurassic World: Blue, another VR experience based on the dinosaurs-run-amok franchise. The two-part companion to Jurassic World: Fallen Kingdom is designed for both the Oculus Go and Rift, and follows its namesake intelligent velociraptor around Isla Nublar as she struggles against other dinosaurs as well as the island itself. Yes, it's a movie tie-in, but part of the attraction is an improved take on the behind-the-scenes technology. Simply speaking, it should look nicer than Apatosaurus did. You won't see 'holes' at the very top and bottom of the video sphere, which Felix and Paul says is a first for productions with a live action component. The crew also used its custom VR camera on a remotely-controlled cable cam to improve the immersion, and the image itself has been optimized for more resolution "where it most matters." As before, Industrial Light & Magic animators helped out with the computer-generated dinos. The first Blue episode should be available through the Oculus Store sometime on May 1st, and the second half will be available sometime in mid-May. It's bound to be a short experience, but look at this way: if you're picking up an Oculus headset and want some VR content to get you started, this could be a good way to get your virtual feet wet.